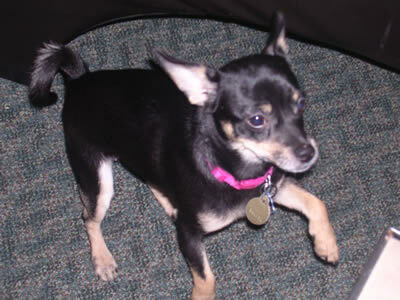 Meadow Soprano the Chiweenie,arrived in July of 2011. With Lola Sanchez taking an unauthorized leave of absence for three weeks, Ms Soprano was brought in to take up the slack caused by the missing Ms Sanchez. After final approval was given by Dodi Schimmel, Ms Soprano quickly acclimated to her new surroundings with playful exuberance. When Ms Sanchez finally returned, Ms Soprano politely returned Ms Sanchez’s duties back to her. With now having less responsibilities around the house, Ms Soprano has been trying to establish a cheesecake business in the area. After the passing of Ms Schimmel and Ms Sanchez, Ms Soprano has assumed the responsiblities and workload of the multiple businesses that were passed on to her.